It’s by no means a new company because it can trace its rich history back more than 200 years in a village of the same name, one where nearly all the adult inhabitants are still employed in the factory in some shape or other. The destiny of Huglu – the village and the factory – were firmly cemented in 1914 when the gunmaking concern became a co-operative whereby each member of staff was made a part owner in the firm. In turn each employee agreed to pay a percentage of their wage back to the company. It’s clearly an initiative that’s worked well because today Huglu is thriving and making a wide range of shotguns for the sporting shooter. This month’s test gun is the 103, a field gun with 28 in monoblock barrels which have passed special steel shot proof and chambered for 3in (76mm) cartridges. 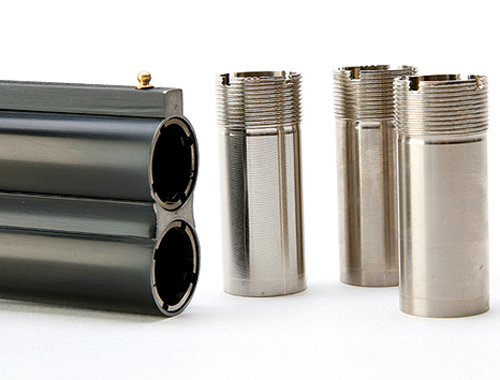 The bores are chrome lined for easy cleaning and threaded internally at the muzzle to accept screw-in chokes. You get five with each gun. Overall weight is 8lb which should help dampen the recoil from magnum cartridges if that’s what you intend using from time to time. The gun might seem slightly heavy at first but it balances, handles and points exceptionally well – a real bonus in a gun of this price. Whichever way you look at it this gun is a basic entry level model that should appeal to the first-time buyer or the sportsman who wants a reliable gun that’s likely to take a few knocks in the course of its duty. The whole package is solidly built and lacks a bit of finesse here and there but for a gun in this class the 103 isn’t badly finished in terms of its internal parts and jointing. The action frame has been given a satin silver finish with border engraving and this treatment contrasts nicely with the furniture (safety catch, top lever and fore-end iron) that’s finished in black. Huglu’s company insignia of a double headed eagle in gold appears on the top lever spindle. 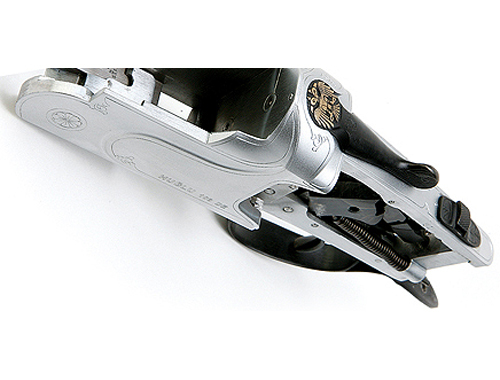 The mechanical layout follows the familiar Browning-type pattern of sears suspended below the top strap and the hammers – powered by coil springs – pivot from the bottom of the trigger plate. 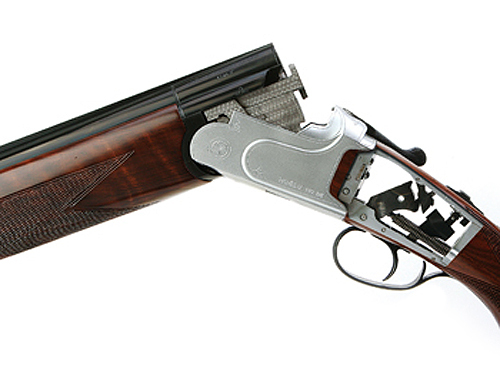 The integral manual safety catch and selector button works by moving through a gate in classic Browning/ Miroku fashion. The ejectors are powered by coil springs and throw spent cartridge cases well clear of the standing breech. Huglu’s woodwork department has wisely fitted the gun with a stock that’s 15in to centre, a length that also includes a slim, black, rubber pad with hard heel piece to prevent shoulder drag during mounting. The reason I say ‘wisely’ is that from a gunsmith’s point of view it is always easier to shorten a stock to suit a customer than it is to lengthen one. The woodwork is nicely shaped with standard stock dimensions which should suit most folk – drop at comb and heel are 1.1/2in and 2.1/8in respectively and the stock carries a slight cast for the right-hander. 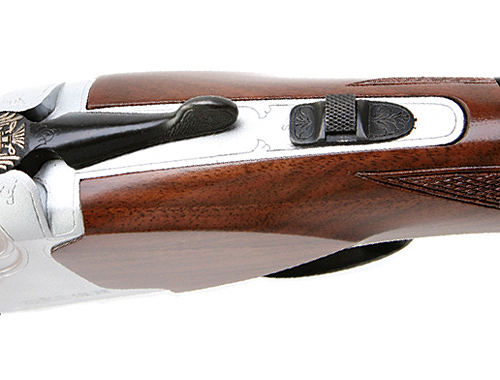 Wood quality is very good considering the price of this gun but, then, if you can’t get good wood from Turkey you won’t get it anywhere – almost all the walnut used on shotguns today comes from that country! 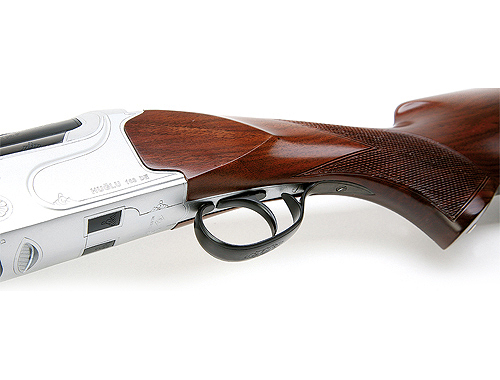 This gun might lack a little sophistication but it has been built to a price, and to do a job. Compared to other guns in its class the 103 is better finished than most and I would say it should prove to be a reliable performer. It represents very good value for money. Contact: Edgar Brothers Shooting Sports.